Of course you do. Since 1942, the Little Golden Books series has been a part of the lives of millions of American children. A Special Collections exhibit currently running at the Harold Washington Library showcases a favorite element of these famous little books: their artwork. With 60 works of original illustration stretching from the 1940s to the present, Golden Legacy: Original Artwork from 65 Years of Golden Books offers a smile-inducing combination of nostalgia and creativity. Works from perennial classics like Poky Little Puppy (1942, illustrated by Gustaf Tenngren) steal no spotlight from more modern gems like Dan Yaccarino's Mother Goose (2003), and some early work, like Alice and Martin Proverson's illustrations for The Color Kittens (1949) looks positively modern. Keep your eyes peeled for my personal favorite piece, a triptych from Richard Scarry's I Am a Bunny. The exhibit is free and open to the public; simply take the elevator from the third to the ninth floor and wind your way through the Harold Washington exhibit to the Special Collections space. 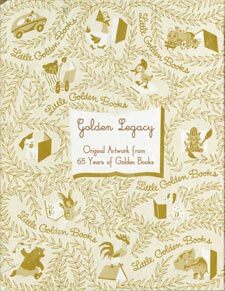 Golden Legacy: Original Artwork from 65 Years of Golden Books will continue through January 7, 2011 at the Harold Washington Library Center's Special Collections Exhibit Hall, 400 S. State St., Ninth Floor.